Good Customer Service > Bad Wheel? The rear tire went flat on our recumbent tandem during a ride a couple of weekends ago. This wouldn't be unusual except we never have flats. Well, except for that one time. Oh, and that other time. Anyway, it's rare that we get flats, because we run Kevlar-belted tires with heavy duty tubes on a wheel that weighs about eight pounds (some entire racing bikes don't weigh much more than that). 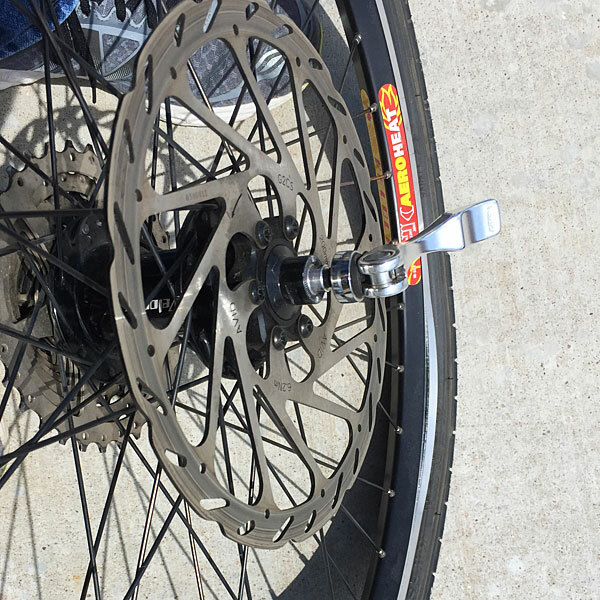 A flat tire is pretty much the worst thing that can happen on a bike ride. OK, I guess you could get run over by a jacked-up truck sporting mudflaps adorned with naked chromed ladies and that would probably be worse. Also, there's always the possibility of a rattlesnake jumping out from the side of the road and biting you on the neck and that would definitely qualify as a bad. Or, a toilet could drop on your head from a passing airliner. But otherwise, a flat is as bad as it gets. It was only after changing out the tube (and unsuccessfully attempting to inflate the new one with five CO2 cartridges...that's a whole other story that I haven't recovered enough to share) that I found the cause of the problem: a failure of the rear wheel itself. It literally came apart at the seam - I didn't even realize it had a seam - which in turn sliced the tube, and voila! - our ride became a walk home. Full disclosure: Since the wheel and tube were already ruined, and I had already resolved to replace the tire, we did continue to ride, albeit very slowly and with much wobbling, until we came to the dirt road that represented the shortest route to the house. This is not a recommended practice, except in the event of a catastrophic failure, but it did save us almost a mile of walking. This is what an intact Velocity Aeroheat rim looks like. And this is what our Aeroheat rim looked like. Later that afternoon, I took the wheel to our local bike shop, Peyton's Bikes, where the mechanic was suitably impressed by the distressed wheel. I asked him to locate a replacement rim - preferably one that tended to remain in one piece - along with a new tire and tube. 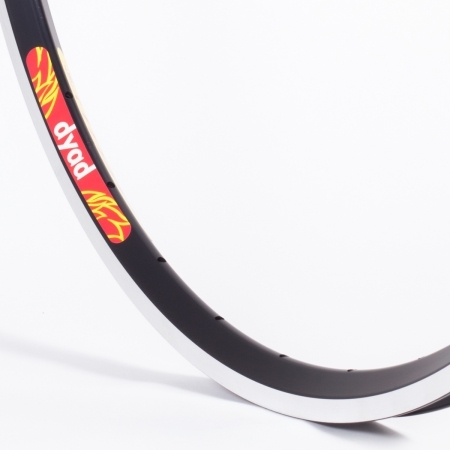 A day or so later, I decided to look on Velocity's website to see if they made an alternative rim that might work better. In doing so, I discovered they provided a lifetime warranty on their rims, so I submitted their online form that described the issue. Within a few hours, the company's general manager responded by email, asking if I could provide photos of the rim. I sent him a couple and he quickly replied that they would honor the warranty and replace the rim. He also said that the owner of Peyton's Bikes had already been in touch with him to discuss the situation, and they had agreed that it was appropriate to replace both rims, to avoid any possibility of a repeat of the problem on the front wheel. 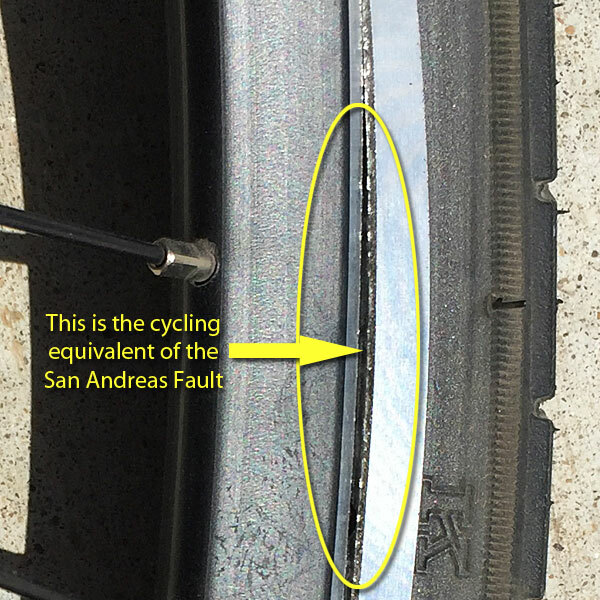 The bike shop owner did call that same day, and said that he had done some online research that indicated that this particular rim was prone to this kind of failure. Indeed, I found some discussions on a message board supporting this finding (here's one example; here's another). We counted ourselves fortunate that the failure of the wheel occurred on flat ground at a relatively low speed. The tire went flat, as opposed to blowing out...another blessing. I shudder to think about the implications of this happening while on a 30 mph downhill at Horseshoe Bay, where we were riding a week earlier. Anyway, it looks like our bike will soon be sporting a new set of wheels. Surely a model called "Atlas" will handle anything we throw at it. The downside is that they won't be the sleek aero profile of the old ones, and they'll have the usual silver finish that most bike wheels have, but that's just cosmetics. The new rims will be as close to bulletproof as you can get on a road bike, and the peace of mind that comes with knowing we'll be safer on the road significantly outweighs the appearance factor. Also, it's nice to know that some companies are still willing to honor their commitments via responsive, unquestioning service. I hate it that the rim failed, but I commend Velocity for its customer service. This page contains a single entry by Eric published on April 27, 2016 8:38 PM. Ten Cover Songs Worth Checking Out was the previous entry in this blog. Bird Talk is the next entry in this blog.